My list is simple for Monday. Spend as much time with the kids as possible. Engaged. Focused. Enjoyed. The pressures I put on myself are hard. I save the highest expectations for myself. Often at night when the kids are asleep (as I am writing this post) the mommy guilt sets in. "Was I too hard on her when I disciplined today?" "I feel he doesn't get as much attention as her because he's our second child." "Is keeping her home from school until Kindergarten the right decision?" "I need to keep off the computer more during the daytime." Some nights the questioning of my parenting is endless. To know that I carry my children from the womb to full-grown adults is a privilege and an intimidating one. Choices I make today will affect them well into their teenage years and when they become parents! Where is the peace? Where is my direction? 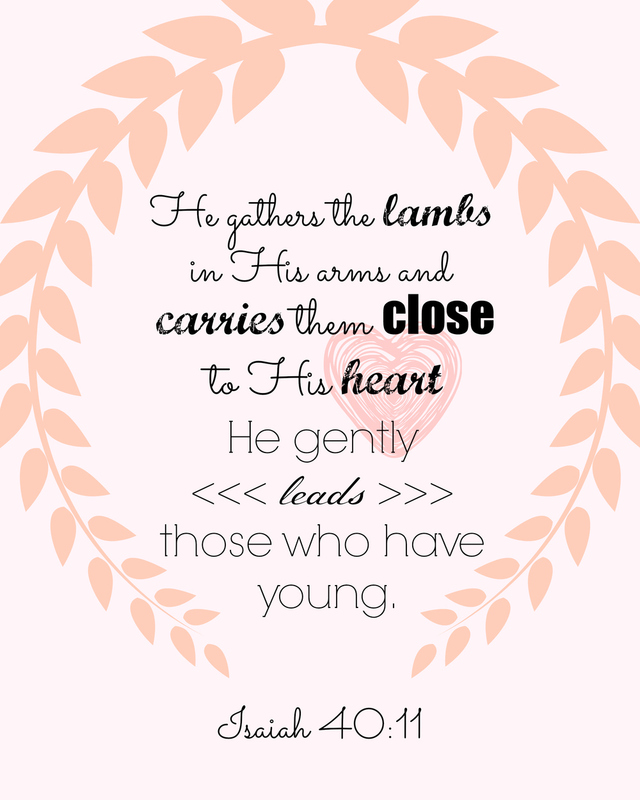 Click here or on the scripture art (8x10) to print and keep Isaiah 40:11 as a reminder throughout the day. No one loves my children more than God does. Not even my husband and I. Who greater should I trust with their future? Even though I am grown up, as a believer I am also God's child. God is holding me right there close to his heart along my children and as a mommy there's no safer place to be. My Shepherd Will Supply My Need verse 3 The sure provisions of my God attend me all my days; Oh, may his house be my abode and all my work be praise. There would I find a settled rest while others go and come, No more a stranger or a guest but like a child at home. Father, You are the way, the truth and the life. Thank you for your gentleness and forgiveness. Your grace for us motivates the grace we share with our kids. When we need to say sorry - may we be humble and do so. When we need to reassure our kids that they are forgiven by us and you - may we tell them with sincerity. When Satan accuses our choices or example as parents - may we turn to you, our gentle leader, and trust your direction above all others. In Jesus' name, Amen.